You'll meet our greeter at the Florence Santa Maria Novella train station and board the high-speed train to reach Rome Termini in just 1.5 hours. Once in Rome, you jump on a City Sightseeing hop on and off double decker bus where you'll see all the iconic spots in Rome. You'll get to the Colosseum for your first tour starting at 10:15AM. Here you'll enjoy special skip-the-line access means you’ll get a thrilling, in-depth exploration of the iconic Colosseum and other sites of ancient Rome. At the completion of your Colosseum tour you jump back on the double decker bus taking you to the Vatican Museums stop. You’ll also get to see the wonders of the Vatican City, including the Sistine Chapel and St. Peter’s Basilica, without waiting to enter. On each group tour, you'll be accompanied by an English-speaking expert in Roman art and history. 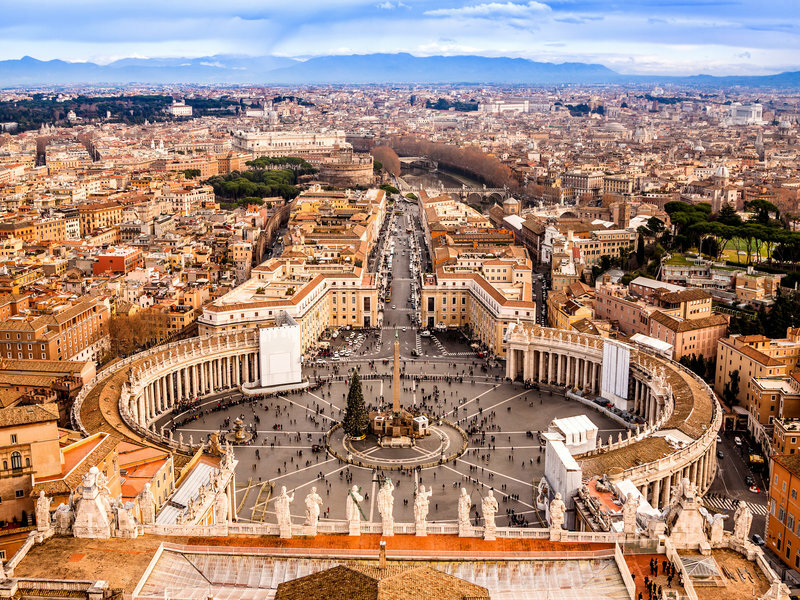 Meet your guide at 2:15 p.m. at the Vatican Museums, the guide will give you an overview of the history and art of the smallest state in the World. At the entrance to the Vatican Museums—and skipping right past the long entry lines—you’ll walk through cavernous galleries filled with ancient sculptures, tapestries, maps, and Etruscan antiquities. The most famous frescoes in the world will greet you when you enter the jewel box of the Sistine Chapel. Here, you’ll be surrounded by the stunning Michelangelo masterpieces that have adorned a million picture postcards—including the nine central panels of the chapel ceiling, each depicting a tale from Genesis (the most famous being The Creation of Adam). This grand cathedral—one of the world’s largest churches, and one of its most sacred Catholic sites—sits atop the very spot where St. Peter was buried. On this self-guided part of the tour, you’ll see the church’s chapels and elaborately painted, multi-domed ceiling; also, Michelangelo’s remarkable Pietà—a sculptural depiction of the Virgin Mary cradling her dying son. IMPORTANT: The Basilica is closed on Wednesdays for the Papal Audience. Please note that the Vatican tour is not available on Sundays. Extra closures can occur in case of religious festivities or special religious functions, please check availability before. IMPORTANT: Extra closures can anyway occur without notice, so be sure to check in advance.